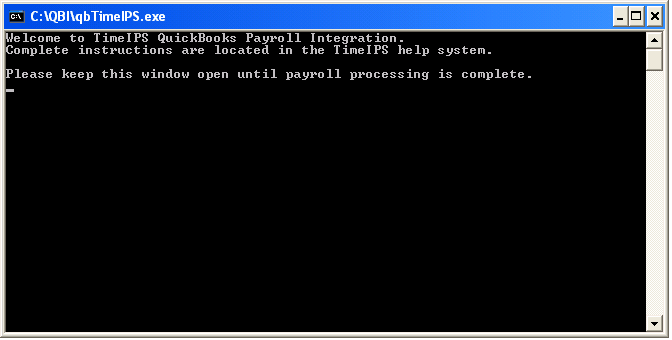 You have now setup QuickBooks and TimeIPS and are ready to run the integration. Switch to multi-user mode in QuickBooks. Go to the File menu - Switch to Multi-User Mode option. Double-click on the qbTimeIPS.exe file you downloaded and saved to your computer when Setting up TimeIPS. NOTE: The qbTimeIPS.exe client must be running each time you run the payoll integration. The screen above should be open. In the TimeIPS Payroll Export page, Select the Employee(s) and the Payroll Period Ending. NOTE: All Employees are selected by default. Select a group of employees by clicking on their names while holding down the CTRL key. 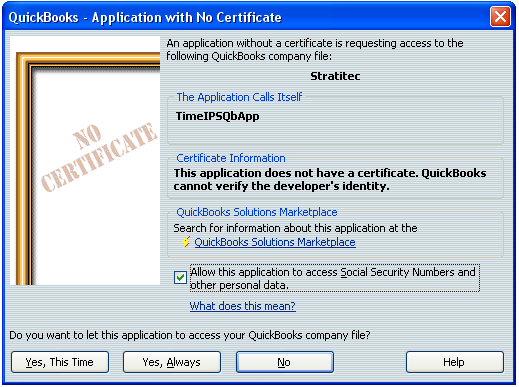 If prompted, allow TimeIPS to access employee's data in QuickBooks. If running the integration for the first time, the prompt below will appear. 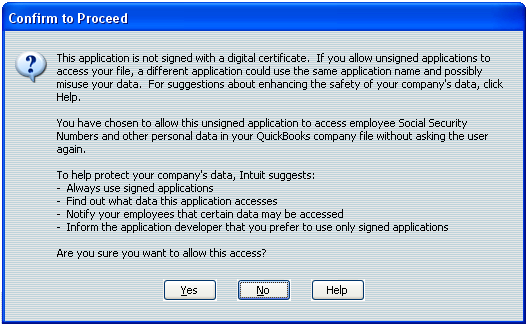 Check Allow this application to access Social Security Numbers and other personal data. Click on the Yes, Always button. NOTE: TimeIPS matches TimeIPS employee records to QuickBook records by employee's names. Therefore, the TimeIPs client must have access to this personal data everytime the integration is run. Confirm the access by clicking on the Yes button. Once the integration is complete, you can successfully close down the qbTimeIPS.exe program by clicking on the close icon (X) in the upper right hand corner. WARNING: Once the TimeIPS data (hours worked) is successfully integrated with QuickBooks, the payroll data will be marked as "Payrolled" in TimeIPS and can not be integrated again. Now that you have setup QuickBooks and TimeIPS and have successfully integrated your Payroll data, you can simply Run Payroll next payroll period.